Milanese style just means a breaded cutlet – – This is easy to throw together and the cutlets rival my old standby recipe – it’s the parmesan cheese in them that make these really special. Change up the salad by adding different veggies; tonight I had some left over zucchini and radishes that I threw in. Sprinkle chicken with salt and pepper. Rinse chicken in water. 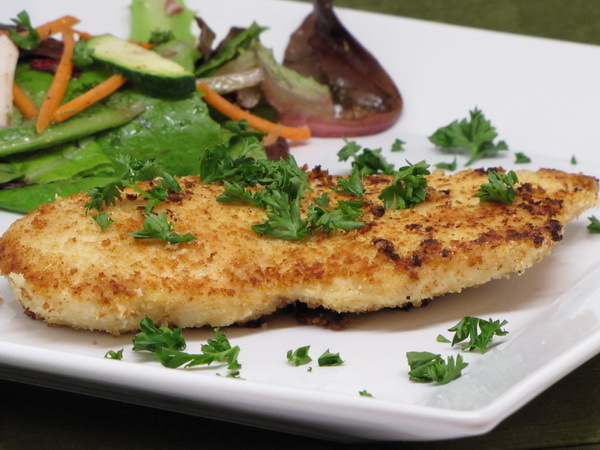 Combine bread crumbs and parmesan in a bowl and press chicken cutlets in to coat well. Spray a skillet with Pam and heat over medium heat and add the chicken and cook about 4-5 minutes per side or until browned. 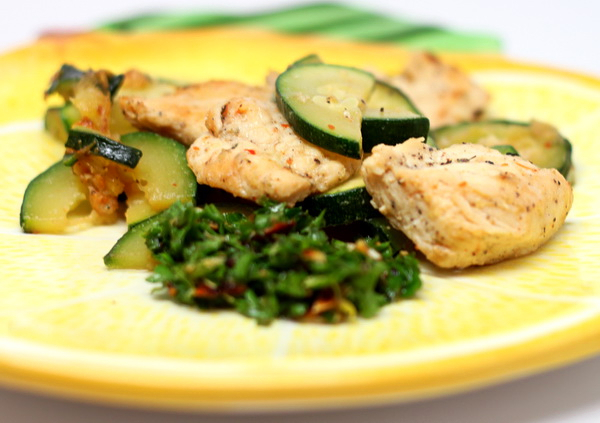 Mix the salad greens, carrots, tomatoes and dressing and serve salad alongside chicken cutlet. These make a great side dish to a chicken or fish dinner. Or make a double batch and serve as appetizers at your next get together. Warm and homey without being a heavy dish and these make a really nice presentation – just perfect ! Heat oven to 400 degrees. 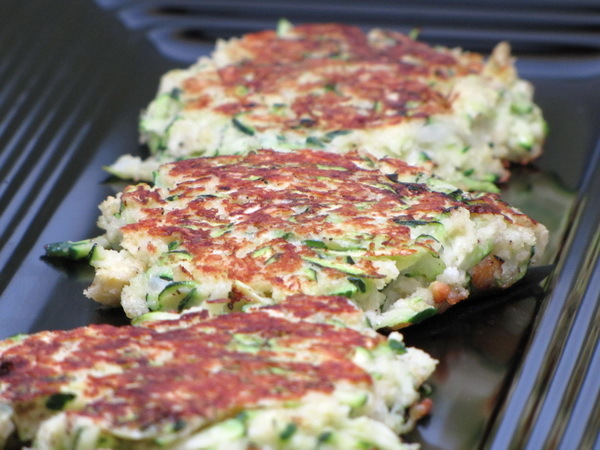 Mix zucchini with oil and place on a baking sheet. Sprinkle with salt and pepper them bake until tender, about 15 minutes. Spray a cupcake tin with Pam. 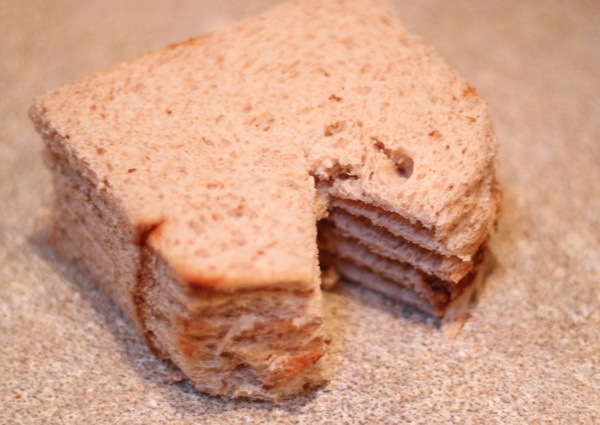 Flatten bread with a rolling pin or the bottom of a heavy pan and cut out a notch in the top so that when you place it in the cucpcake tins, it will wrap around nicely. Then press into the bottom of the cupcake cups. 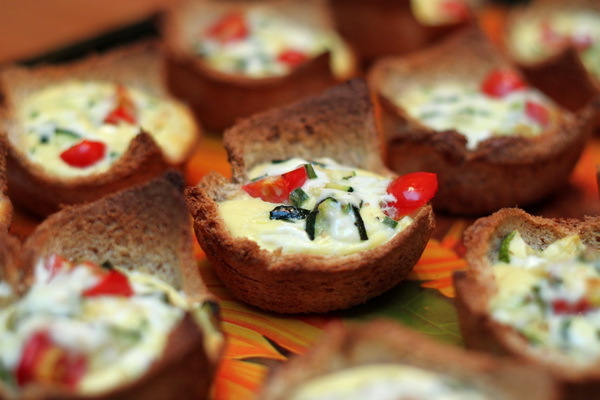 Mix zucchini and tomatoes and spoon into the cups. Beat eggs, cream cheese, cream, chives, salt and pepper. Pour into the cups and bake 15-20 minutes or until they are set. This is all the good stuff out of the salad and leaves the lettuce behind. 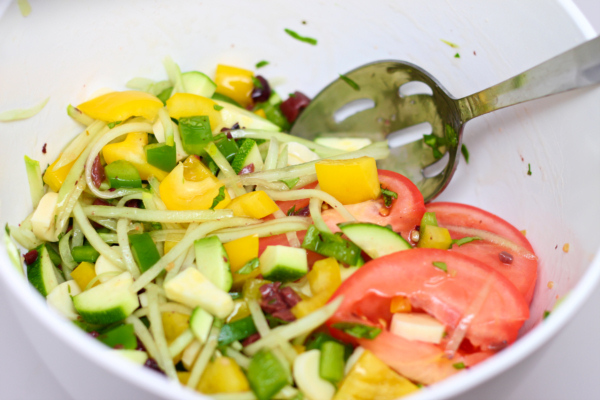 Crisp, refreshing and a great summer salad. Mix all together and refrigerate at least 1 hour. 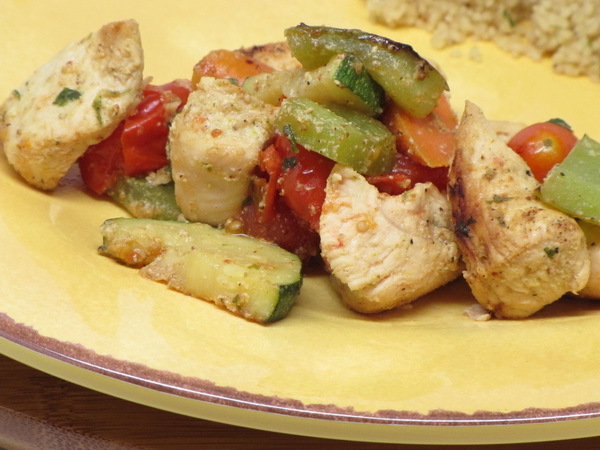 This is such a great flavorful dish – and all the added zucchini makes it a healthful option. This tasted just as good cold the next day and would be a great take along for a packed lunch – even add a few strips of grilled chicken if you want ! 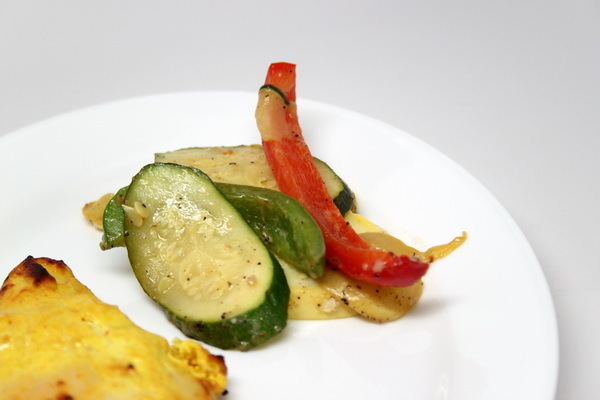 Heat 2 t oil and sauté zucchini 5 minutes. Add 1 t minced garlic, salt and pepper and cook another minute. Cook pasta according to package instructions in salted water, drain reserving 1/3 cup of the cooking liquid. 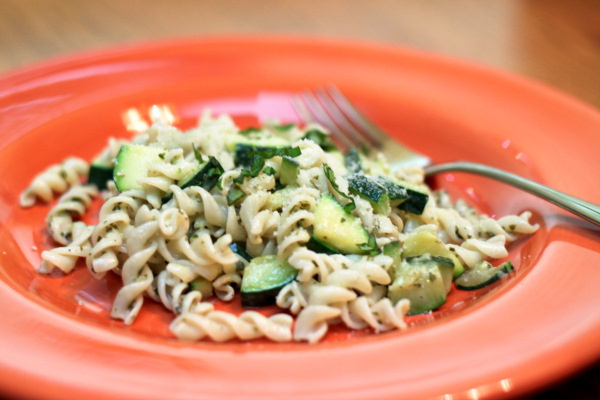 Add pasta to zucchini and stir then add reserved water, half and half, pesto sauce and additional salt and pepper. Serve garnished with parmesan and basil. This is a superb soup – the broth is so rich and full bodied it could almost be used as a tomato sauce if you thickened it up some. 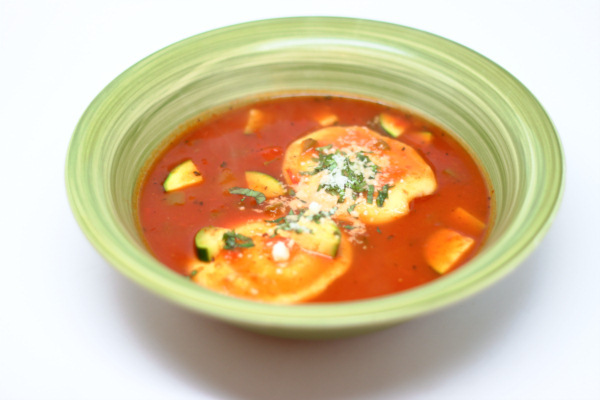 The ravioli are a great addition as the cheesiness mixes so well with the tomato based broth. Any cheese pasta would do well here, but the ravioli makes it just a little different and oh so yummy ! Heat oil in a large soup pot and add peppers, onions, garlic and red pepper. Saute for 4 minutes then add tomatoes, broth, water and spice. Bring to a boil and add ravioli and cook 3 minutes less than the package instructions. Add zucchini, return to boil and cook another 3 minutes. Garnish with some parmesan cheese if you would like (not included in calorie count). 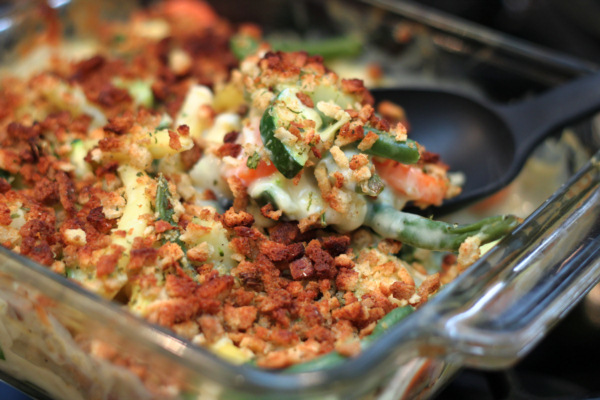 Very cheesy, very veggie – this is a veggie dish that will really get the kids eating up ! Preheat oven to 350 degrees. Mix soup, sour cream, onion powder and pepper then stir in veggies, 1/2 c cheese. Turn into a 2 quart baking dish. Cover and bake 40 minutes. Stir and then top with the rest of the cheese and the stuffing mix and bake 5 minutes uncovered.